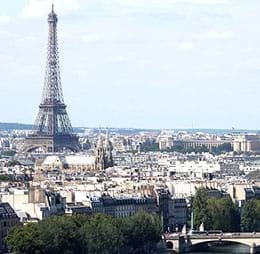 Paris is one of the legendary capitals in Europe for its countless tourist attractions, world class museums, breathtaking sightseeing’s, architectural Buildings and much more. The Romantic French capital Paris ranks among the most beautiful travel destination on the planet that had no limit to invite visitors from all across the world. It is home for many beautiful attractions including Eiffel Tower, Notre Dame de Paris, The Louvre, Arc de Triomphe, Musée d'Orsay, and Champs-Élysées. Paris isn't only the capital of France, but also home for world class shopping centers, luxury boutiques, and fashion stores. You can find endless shopping malls in Paris like Aligre Market, Bercy Village, Avenue des Champs Elysées, Avenue des Ternes, and Bastille Market. The charming streets of Paris are well equipped with numerous street shops, unique fashion shops, and much more. Paris is one of the finest destinations in the world to taste traditional French cuisine, wine, Champaign and French cheese. French capital has a great collection of the best romantic restaurants including Le Calife, Le Cinq, Pierre Gagnaire, Paris Picnic, and Sacrée fleur. When you’re in Paris for the first time, never miss to taste mouth-watering French dishes like Baguette, Croque-Monsieur, Mousse au Chocolat, and much more. Paris is a bustling city for its best nightlife with local bars, pubs, rooftop parties, live music, dance parties and musical artists. Whether you're looking to tap into the roof-top bars or searching for a memorable evening with your loved once. Paris has everything to attract young party makers from around the world. French capital is a home for some of the world class local bars including Buddha-Bar, Experimental Cocktail Club, Au Lapin Agile, Le Baron, and Ritz Paris. Paris has excellent public transportation system to get around the city. There are many ways to move from one place to another, ranging from buses to trains and taxi to boats. Paris bus network operates several hundreds of city buses connecting to all major destinations. Taxi and cab services are bit expensive in Paris. Charles de Gaulle Airport is one of the busiest airport in Europe, serves several million travelers from all across the world. The airport is a main hub for Air France, Delta Air Lines, FedEx Express and XL Airways France. It is located 14 miles (23 kilometers) northeast of Paris. Terminal 1: Terminal 1 is a circular multi-level building, offers world class amenities’ for domestic and international visitors. T1 is well equipped with unlimited free Wi-Fi, ATM's, baby care, car rentals, cots, information desk, luggage storage, duty free shopping and many more. Charles de Gaulle Airport is well connected by various modes of transportation including train, bus, car, taxi, and airport shuttle. Taxi and cab services are available 24/7. The Roissybus operates large number of buses, which run through the Suburbs of Paris from the Charles de Gaulle Airport. The bus runs every day from 06:00 to 23:00 from all three terminals.